If you’ve ever worked out without any music plugged in, then you can appreciate how awesome it is to workout with the right tunes playing. With no music to listen to, you are left to your own thoughts and perceptions. Some exercisers may like to workout this way, but the majority prefer to jam to their favorite tunes and lose themselves in the music (instead of the pain of the workout!). Music can hit on almost every emotion, bring back memories, and inspire. When music is used while pushing through a tough workout, it can be magic. Humans are sensory beings, and music can be the spark to ignite a great workout. Research and studies have shown the immense benefits of listening to the right music while you workout. Music can distract you from how tired you feel or how hard you are actually working. It can speed up your pace and give you added endurance. So how do you choose your sweaty beats and create the perfect workout playlist? Everyone is different; there’s no surprise there. 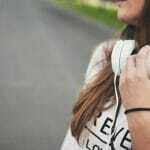 The choice of music or particular song will always remain totally subjective, but there still remain a few pointers to keep in mind when you are creating your own workout playlist. Pump It Up. Up-tempo songs tend to inspire people. A song with a slow beat was written to inspire that particular emotion, and if your mind is in the mood to be slow and mellow, that doesn’t bode well for a workout. The same research that discovered how great music can be for a workout also discovered that people often subconsciously match the pace of of a workout or run to the pace (tempo) of the music. If you are struggling with long runs, or runs in general, try picking up the pace of your song and see if you don’t pick up the pace of your run. Look For Inspiration. Musical inspiration comes in many forms. An upbeat song doesn’t always mean it’s inspiring, and there are plenty of slower songs that inspire musically and lyrically. Save these songs for a slower point in the workout. This will always come back to personal preference, but scour your music library and look for inspiring songs that fit you. These songs may start slow and gradually build up: perfect for a workout playlist! Match Your Playlist To Your Workout. To create some really killer sweaty beats, you can get creative and try to match the songs you put on your playlist with what you’ll be doing in your workout. You can choose a slower, more instrumentally building-up type of song to listen to while you warm up, then move into a faster-paced motivator. As your workout intensifies, it’s a perfect time for an intense upbeat tune with a good tempo to get you going. You really can’t go wrong. Working out and music are a cool combination.